WHO CAN SAVE OUR FLAG? Born in Norfolk Virginia on February 29,1840, his name was simply “William”. He was a slave who ultimately found his freedom through the underground railroad. He ended up in Massachussetts where he found his father. Together, he and his father eventually bought the remaining family members out from the bonds of slavery. He volunteered for the 54th Massachussetts Volunteer Infantry as Sergant alongside my own great great uncle. 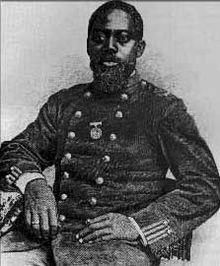 On July 18,1863, the assault on Fort Wagner in Charleston South Carolina took place and Sergeant Carney was there. His actions that day earned him the Medal Of Honor. Sergeant Carney was not awarded his Medal of Honor for some 37 years after the action. This made him the last African-American to be awarded the Medal for Civil War service.